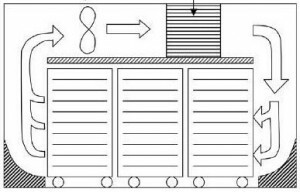 The term Instant Freezer commonly refers to a batch blast freezing operation in which the product, loaded on trolleys, is wheeled into a large cabinet where it remains until frozen. In the cabinet, fans blow circulating air through evaporators. This cold air then flows uniformly over the product loaded on the racks or trolleys below.